These double-ended, super-cute boot cuffs let you choose your look! 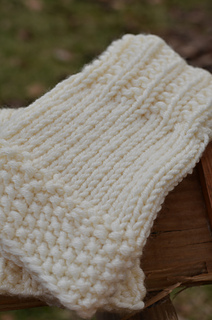 Quick and easy using bulky yarn, these boot cuffs feature seed stitch on one end and a farrow rib pattern on the other, with stockinette between the two. 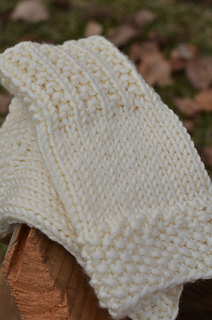 The farrow rib gives an open weave look while the seed stitch is a little more dressy. Yarn note: There is so much variation in yarn weight classifications. Original design is knit on Uptown Bulky by Universal, which is considered a “Super Bulky,” however it is NOT nearly as bulky as Malabrigo Rasta or Wool-Ease Thick and Quick. It’s about half the thickness of those. When substituting yarn, look for a lighter weight “super bulky,” and as always, check gauge!